Just how long do air conditioner AC units last? You see, when it comes to keeping your home nice and comfortable, even in the most oppressive of the summer months, one of the most important things you can have in your home is a working and efficient air conditioner. These cooling machines are absolutely essential to most homeowners nowadays with people investing whatever they can to get the relief they need during those nearly unbearable heat waves. However, when you make this kind of a purchase, you want to make sure you’re really getting the most for your money. Luckily, modern air conditioners are developed specifically with longevity and durability in mind, helping to ensure that homeowners reap the rewards of their investments for years to come. However, the type of air conditioner you invest in and the care you provide for it over the years can make a world of difference. Here are a few facts you need to know about the life expectancy of the different types of air conditioners today. How Long Do Central AC Units Last? Central air conditioning is, without a doubt, one of the most efficient and effective forms of temperature control out there. They have been developed with the comfort of homeowners in mind, and so you can rest assured knowing that they’ll be able to cool off your entire home quickly and without any sort of issues along the way. Additionally, because they are developed as larger and more durable units, central air is one of the longest lasting forms of air conditioning available today. Many professional manufacturers will even guarantee that their units last you anywhere from 15 to 20 years, provided that you make sure to care for it and invest in the proper maintenance as time goes by. When it comes to choosing and caring for a central air conditioning unit, there are certain key points that need to be taken into consideration and that will have a tremendous impact on the overall lifespan. First of all, you need to look at the manufacturer. When purchasing your air conditioner, you want to make sure you invest in a machine that has a reputation for excellence and efficiency. Take a good look at reviews and testimonials from past customers so that you can be sure you’re purchasing a unit that you can rely on. You’ll also need to make sure to stay on top of your standard yearly maintenance. 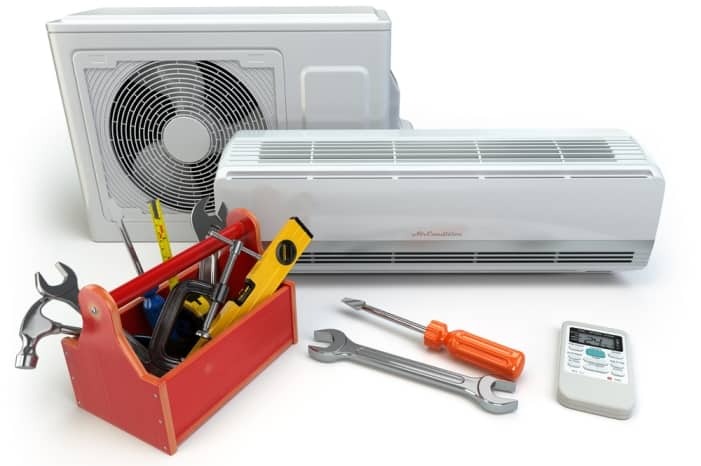 This will include changing the unit filters, removing any debris that may fall on top of or near the unit itself, checking the insulation that is around the unit for decay, and finally finding a reliable service professional to come once a year to ensure that everything is running smoothly before you start using it on a daily basis in the summer. Many experts believe that this yearly care can actually make a world of difference in terms of your unit’s eventual lifespan, so make sure you give it the dedication it deserves. How Long Does a Trane Air Conditioner Last? When it comes to choosing your air conditioning unit, one of the most important factors that will come into play will be the manufacturer themselves. While many developers strive to provide their customers with world class units that will keep their home feeling nice and cool for years to come, few have quite the same reputation for longevity and efficiency as Trane. Trane is an air conditioner and furnace manufacturer that has been able to maintain a five-star rating for decades. This is due not only to their diligence with customer service, but also because of the high quality of their machines. This company does everything in its power to guarantee that the unit you install in your home will live up to the highest possible standards in everything from energy usage, the quietness of air production, air quality control, and even longevity. Generally speaking, a Trane AC unit has been known to last anywhere from 15 to 25 years, depending on the aftercare that the homeowner provides it. However, keep in mind that the most common problem that these particular units tend to run into is leaking refrigerant coils. This means that when you start approaching the last few years of the expected lifespan it will be incredibly important that you keep an eye out for these leaks around your unit. How Long Do Window Air Conditioners Last? If you’re looking for a more affordable way to cool your home, then a window AC unit might just be the perfect solution for you. Ideal for smaller spaces such as apartments or mobile homes, these air conditioners have been developed to give you the relief you need for a fraction of the price. Even though these machines are a significantly lower investment for homeowners upfront, the lifespan of the units themselves will generally come down to care and maintenance over time. In most cases, these air conditioning units can be expected to last anywhere from seven to 10 years. However, there are many factors that will come into play. To begin with, you need to consider the number of months out of the year that these units will be used. If you’re planning on turning your air conditioner on for six months out of the year, instead of the standard three, you’ll probably end up cutting down on the general life expectancy quite a bit. These machines will also be much more susceptible to damage from dirt and debris, making it absolutely essential that you take the time to clean out the filters and replace any drainage tubes that have been clogged up over the years. Finally, it’s important to keep in mind that the area and way in which you store these units during the cooler months can really impact the lifespan. Make sure you store it in a dry and clean location, covering it up to ensure that no debris or unexpected materials make their way inside. How Long Do Portable Air Conditioners Last? Are you constantly moving around from place to place and are looking for an air conditioning solution that you can take with you? Portable air conditioners are a great way to make sure you’re comfortable no matter where you need to be and when. However, as far as standard AC units go, these are probably the ones with the lowest lifespan. This can be due to the constant mobility, as well as the lack of care, that they are generally provided while they’re in use. However, if you provide your unit with all the necessary maintenance, you can easily see yourself getting the most out of your little machine for at least five to seven years. Continually maintaining the filters and checking for fluid buildup in the pipes will be essential to providing these units with the care they need to run efficiently. But, as long as you make sure they get the maintenance that they need, these units can actually be some of the most energy efficient and high-quality forms of temperature control available. If you need something that you can take from place to place without worrying about damage and loss of control, then this AC unit will be the ideal solution for you. When it comes to air conditioners, there are quite a few factors that can have a tremendous impact on the lifespan and quality of the unit itself. Between outside debris, built-up filters, leaking drainage systems, and much more, homeowners need to make sure they invest in the proper care of their ACs if they’re looking to get the most out of their initial investment. If you start to notice that your air conditioner just isn’t running the way it used to, there are a few signs that you should look out for that could help you determine whether or not your unit is on its last legs. First, you’ll want to take a look at your electric bills. Are you noticing higher and higher payments at the end of every month? When these machines start to fail, they’ll need to use more energy to produce the same results, which will ultimately reflect in your electric bills. Additionally, you may want to check the actual air conditioning vents to feel the air flow output. If you feel a weak air flow it could mean that your unit is unable to produce the same quantity of temperature controlled air or that there is a blockage somewhere that needs to be immediately addressed. Another sign that you’ll want to look out for will be odd sounds coming from the unit itself. If your air conditioner starts making a grinding or squealing sound, it most likely means that an interior part has been dislocated or broken and that you’ll need to either replace the part or the unit itself to get the temperature control you’re looking for. AC units are an absolutely essential part of any homeowner’s lifestyle nowadays, but getting the most out of your investment is critically important. Keep this information in mind and choose a unit that makes the most sense for you today.